See everything new auntie Rihanna, Big Sean, G-Unit, Tinie Tempah and more have been up to this week. 1. 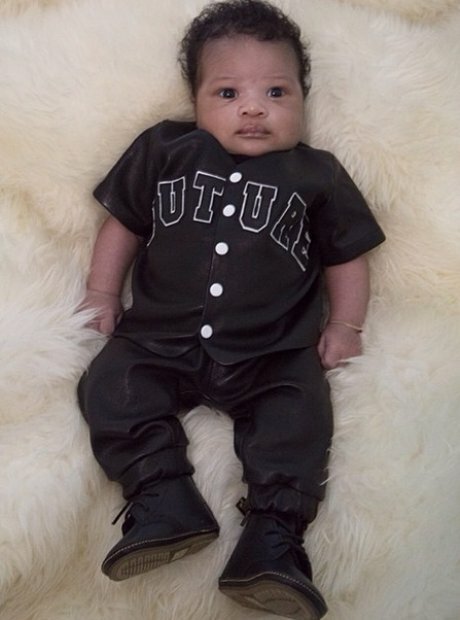 Ciara posted a photo of baby Future for Father's Day with the message that he "loves" his dad. 3. 10th June was official announced as 'Drake Day' in Houston, Texas. 4. This photograph captures Kanye West before he said his vows in Florence. Picture: Courtesy of E! Keeping up with the Kardashians new episodes premiere this Sunday at 9pm on E! 5. New photographs were released from Kanye West and Kim Kardashian's Wedding with North West. KEEPING UP WITH THE KARDASHANS NEW EPISODES FROM THIS SUNDAY AT 9PM ON E! 6. And here's Kanye with his new family, the Kardashian women. 7. Auntie Rihanna continued to be infatuated with the new baby in her family. 9. Tinie Tempah and Dizzee Rascal got together in Ibiza. 10. Disclosure made the most of the weather by visiting a zoo. 12. Calvin Harris and Tinashe found time for a selfie. 15. Usher was the last one in the studio... And he wasn't going anywhere. 19. Rihanna became an auntie and showed off the adorable new baby on Twitter. 20. It looks like babysitting duties are on Auntie Rihanna! 21. Plus Rihanna's nephew graduated from school. Celebrations all round! 22. Rihanna was presented with the 'Most Desirable Woman' award by comedian Kevin Hart. 24. Nicki Minaj swung by a US TV chat show to talk about her new single 'Pills N Potions'. 26. Kanye West celebrated his 37th birthday with this Yeezus birthday cake from Kim Kardashian. 27. Tinie Tempah had a go at hitting Simon's buzzer on Britain's Got Talent. 29. Kendrick Lamar and Kid Ink hung out backstage at a US concert. 31. Calvin Harris and Big Sean spent time working together. 32. G-Unit spent time together ahead of the release of their new album. 33. Jhene Aiko shared her dreamy photo-shoot with Instagram followers.